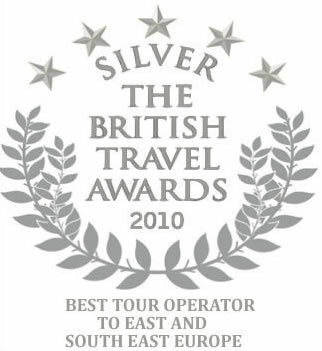 British Travel Award Winner 2010! Balkan Holidays Wins the Silver "Best Tour Operator to East and South East Europe" Award at this years British Travel Awards, which are also known as the "Oscars of the Travel Industry. The awards are voted by the customers (public) as well as travel professionals and the process lasts for around 21 weeks during which time this campaign is supported by some of the UK"s most well known media outlets such as the Sunday Times, Rough Guides, Classic FM and The Sun. This glamorous ceremony is held every year with the aim to demonstrate the public"s appreciation of some of the best performing travel companies around. The event was held at London"s Battersea Evolution and was attended by some of the biggest celebrity names, travel journalists, and of course many travel professionals. This success comes on the back of an impressive year for Balkan Holidays and this award should act as a statement to the strength and dedication of our team who would also like to thank everyone who voted and who recognised our hard work and determination.